“The Common Defense” is the title of a new episode of Madam Secretary that airs tonight (March 24) and CBS has released some preview images and a description to promote it. Here’s the synopsis; the photos follow below. While Elizabeth is away on a retreat thinking about her presidential campaign, her staff tries to secure an international agreement to protect citizens who have been displaced due to global warming. Also, the staff works to contain a measles outbreak that threatens the life of Daisy’s daughter, Joanna, on MADAM SECRETARY, Sunday, March 24 (10:00-11:00 PM, ET/PT) on the CBS Television Network. "The Common Defense" -- While Elizabeth is away on a retreat thinking about her presidential campaign, her staff tries to secure an international agreement to protect citizens who have been displaced due to global warming. Also, the staff works to contain a measles outbreak that threatens the life of Daisy's daughter, Joanna, on MADAM SECRETARY, Sunday, March 24 (10:00-11:00 PM, ET/PT) on the CBS Television Network. 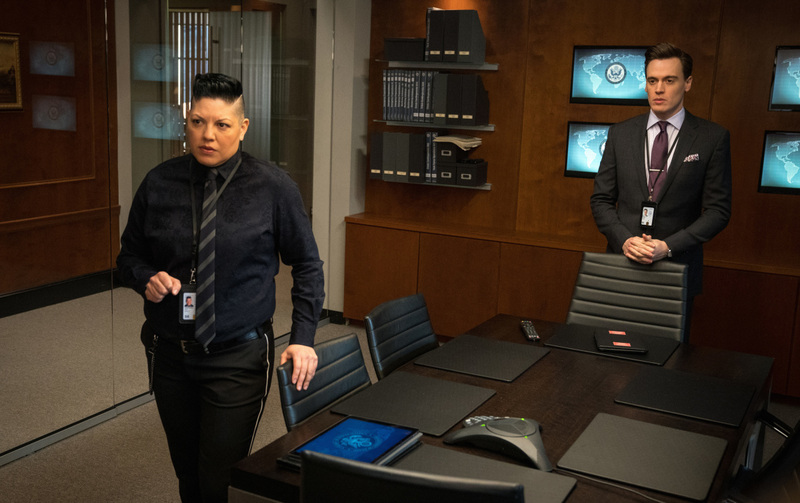 Pictured (L-R) Sara Ramirez as Kat Sandoval and Erich Bergen as Blake Moran Photo: Mark Schafer/CBS ÃÂ©2019 CBS Broadcasting Inc. All Rights Reserved. Guest stars in “The Common Defense” include Tracee Chimo Pallero (Nina Cummings), Sandra Daley (Adele Steele), Murray Bartlett (Australian Prime Minister Chris Lawson), Paton Ashbrook (Tara Davis), John Behlmann (Aaron Davis), Joel De La Fuente (President Datu Andrada), Tonye Patano (Verline Grant), Barbara Walsh (Secretary Angela Tuggle), Reshma Shetty (Dr. Nimmi Bahri), Graham Rowat (Secretary Max Allen), Jacqueline Torres (Esme Rubiano), Tara Summers (Sophie Adams), Cameron Seely (Annie Adams), Toussaint Jeanlouis (Nelson), Almeria Campbell (Dr. Kerry Still), Simon Feil (Doctor), Maria-Christina Oliveras (Francine Tan), David Jachin Kelley (Aussie Border Officer), Georgia Kate Haege (Nurse), Mark Diconzo (DHS Team Leader Carl Burke), Emmett Hunter (Crewman), and Armando Acevedo (Officer Torrez).